These records have been transcribed from the originals by Jan Johnson Barnes and Linda Carpenter. The information comes from privately owned records maintained by Wilkinson & Wiseman Funeral Home in Portland, Sumner County, Tennessee. These records are published with written permission from Charles Wilkinson, to whom we owe our sincerest thanks. Walter Greene Wilkinson was born in Sumner County, Tennessee on September 22, 1876 to parents Thomas James and Elizabeth (Jackson) Wilkinson. On October 30 in 1903, Walter married Bessie Lane. Three years later, in 1906, she looked on as her husband Walter and his brother Luther invested in their first business venture. The brothers acquired the Tobe Anderson Funeral Home in Portland, Tennessee and changed the name to Wilkinson Brothers Funeral Home. Bessie died the 5th of May in 1925. The following Spring, on March 14, 1926, Walter married Myrtle Cage. Fourteen years his junior, she was born February 4, 1890. Their marriage, however, was to be short-lived. She died from complications of childbirth on the 31st of December in 1929. Walter's new partner, younger brother Luther, was born June 1, 1882. Luther's wife, Lillie Harrison, whom he married December 22, 1906, was born May 12, 1887. Luther parted company with his brother in 1910 to open a store that was adjacent to the funeral home. When Luther left, a third brother, Hatton, joined Walter in the Funeral Home business. After about two years in the business, Hatton, too, ventured out on his own to establish a funeral home in White House. Later still, he moved to Greenbrier to operate yet another funeral home there. In 1919, Walter created a partnership with his brother-in-law, James William "Willie" Wiseman, Sr. Willie was born 21 November 1882. Tempie Lane, born 19 August 1885, became his wife on December 22, 1906. Another Wilkinson brother, John E., eventually joined the firm and the name was changed to Wilkinson Brothers and Wiseman Funeral Home. Born on the 12th of January 1887, John was the younger of the brothers who now co-owned a very successful and well-established business in Portland. John's wife, the former Floy Latimer whom he married on May 15, 1920. was a well-known and most beloved school teacher in Portland for more than 40 years. Although her husband, John, died 15 July 1952, it was only recently that Miss Floy died. She was over 100 years old. As the years passed, the business lost its founders and their supportive wives. Walter died on 9 November 1949. Luther died on the 18th of November in 1956. Tempie died 26 July 1968. Willie died 26 November 1970, and Lillie died 11 February 1973. All the family were buried in the Maple Hill Cemetery in Portland, Tennessee. 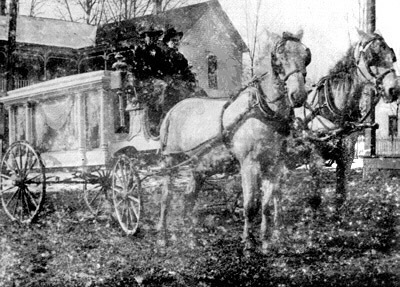 The state did not require funeral homes to keep records until the 1940's, but it is evident from these early recordings that the funeral home offered services for many of the surrounding towns in Sumner County. The present funeral home, located on Highway 109 in Portland, was built about 1955. This business is still owned and operated by Wilkinson and Wiseman descendents. Photo of James William Wiseman, Sr.